Bondi Backpackers i Sydney, Australien : Boka nu! Awesome place with a really good vibe. The friday we came there, they had a BBQ on the roof with free alcohol and food for $2!!! And lots of other activities. Plus free beach equipment and surfboard is amazing. The rooms was all nice, we got the one with a view over bondi beach. Close to bus and restaurants and beach ofc. Really liked it! 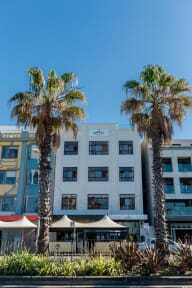 A really nice hostel, super helpful staff, really nice location on Bondi beach, however 30 min bus ride into city, if the city is what you are interested in. Close to many shops, restaurants and super markets. A nice kitchen and a well functioning hostel, with everything you could need. We were given a free room upgrade which was great! Would really recommend this hostel, we stayed for 10 nights because we liked it! Very nice hostel and nice straff!!! Would stay again! Nice and new hostel. Wonderful location right by the beach but it takes a while to get into the city. Chill vibe and nice big airy rooms. I had a beautiful view over Bondi Beach from my room which was wonderful. Small kitchen and dining room but enough for a few persons at a time. Good hostel if u want to meet people. They have thing going on almost every day. The location is just perfect. You can't find a better place. The place was clean, rooms were good and the toilets were good as well. U get what u paid for!